Simply Merry Christmas [J1616] - $10.00 : Yarn Tree, Your wholesale source for cross stitch supplies. Cross stitch pattern by Jardin Prive. Christmas is on it's way! 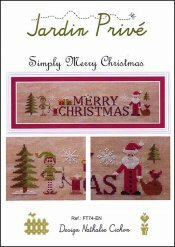 Get out your needle & thread, turn on the Christmas music & enjoy stitching "Simply Merry Christmas." "Merry Christmas," is stitched in the middle of the design, with snow decorating some of the bottoms of the letters. With a needle & thread in his hand, Elf, is ready to help you get some stitching done for Christmas. Santa, with his bag full of gifts, is ready to deliver to all of the good boys & girls. This is "Simply Merry Christmas." Stitch count 214W x 45H. Stitched on #4178 Zweigart Belfast Linen 32ct. Country Mocha Vintage.